Oh, where to go begin! So, unless you have been completely unplugged from the world for the past year or so you most definitely have heard of Disney’s Frozen and the two heroine sisters of the movie, Elsa & Anna. 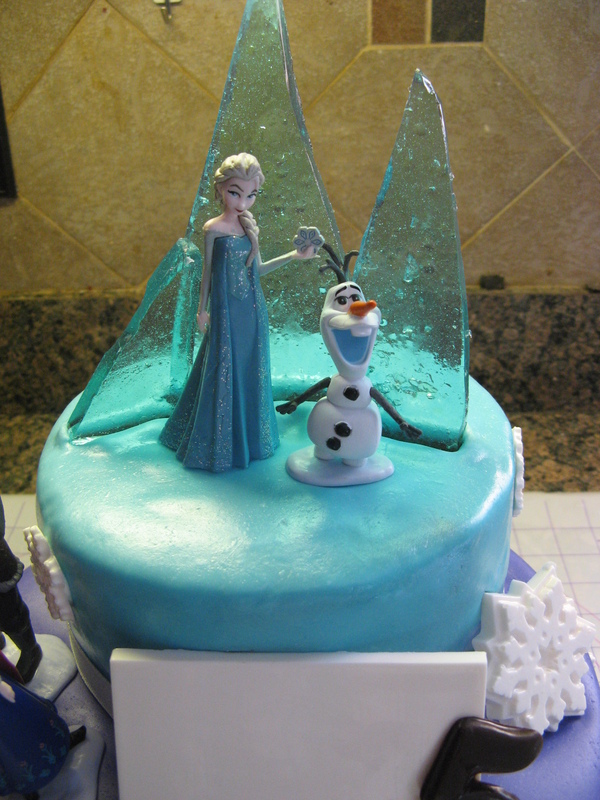 At some point you must have also heard the song “Let It Go,” or the more playful “Do You Want To Build A Snowman?” Hence it came as no surprise that when the time came to make a birthday cake for a friend’s daughter the theme would be Frozen. 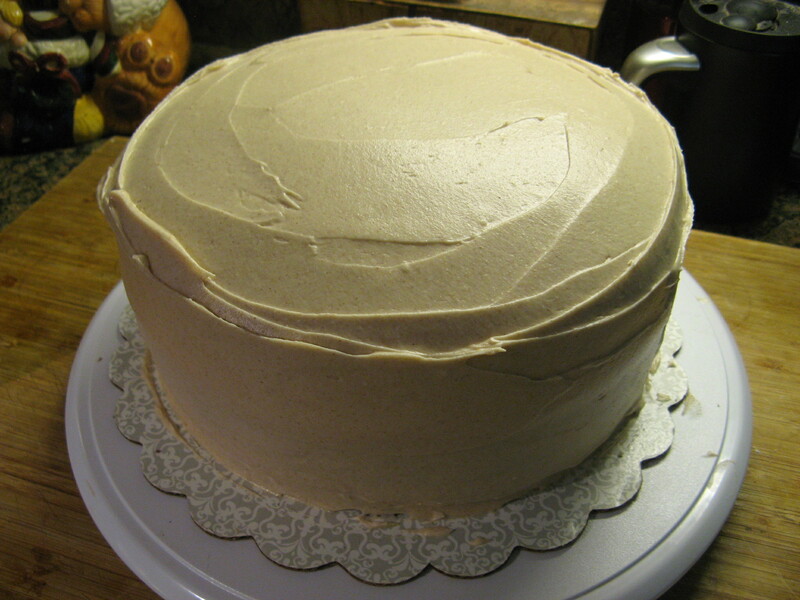 This cake and post is a special one as well since it marks my blog’s third blogiversary! It all started with a 2nd birthday cake for the same little girl this cake was intended for in the shape of Elmo’s head and ever since I have been blogging about other delicious treats I have made and some lovely knitted/crocheted items and handmade jewelry. But, I digress, back to Frozen. 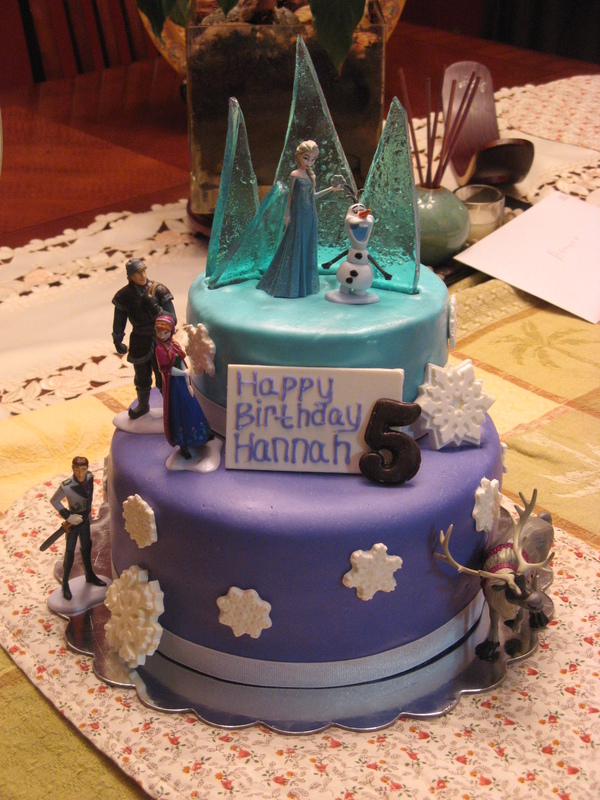 By far this was the most ambitious cake I have ever made and required numerous steps over the course of a few days. 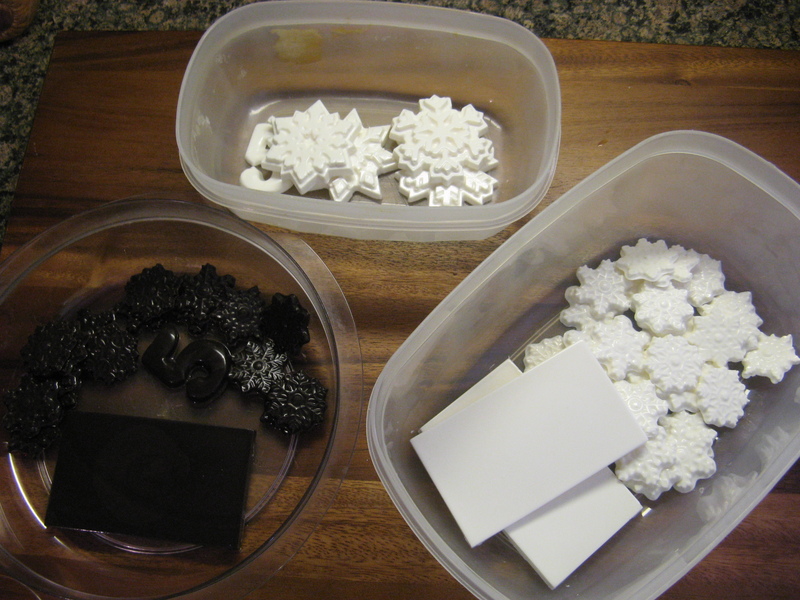 I also made some white chocolate and dark chocolate molds of snowflakes, the number 5 and plaques by melting Wilton candy melts and pouring the melted chocolate into the molds and refrigerating them for at least 15 minutes and then tapping them out on my counter. 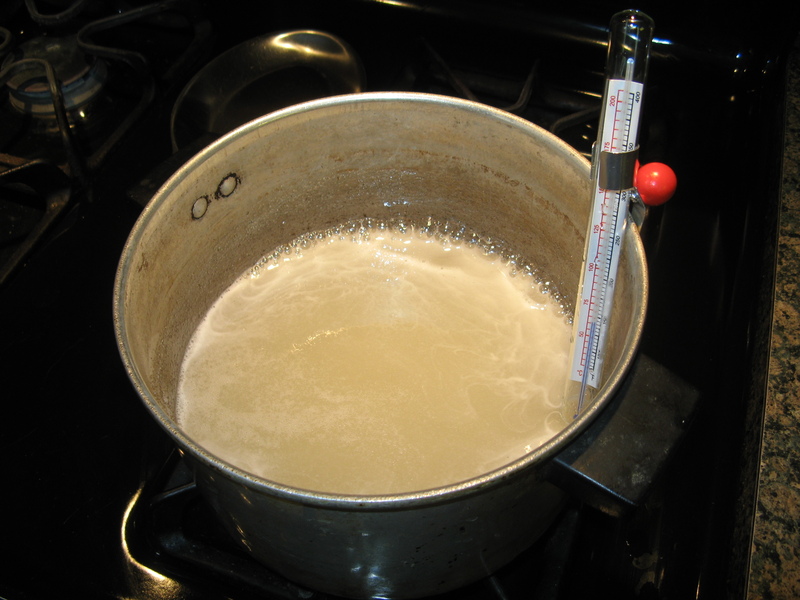 The following day I made hard candy by dissolving sugar in water and light corn syrup by stirring it over medium heat. 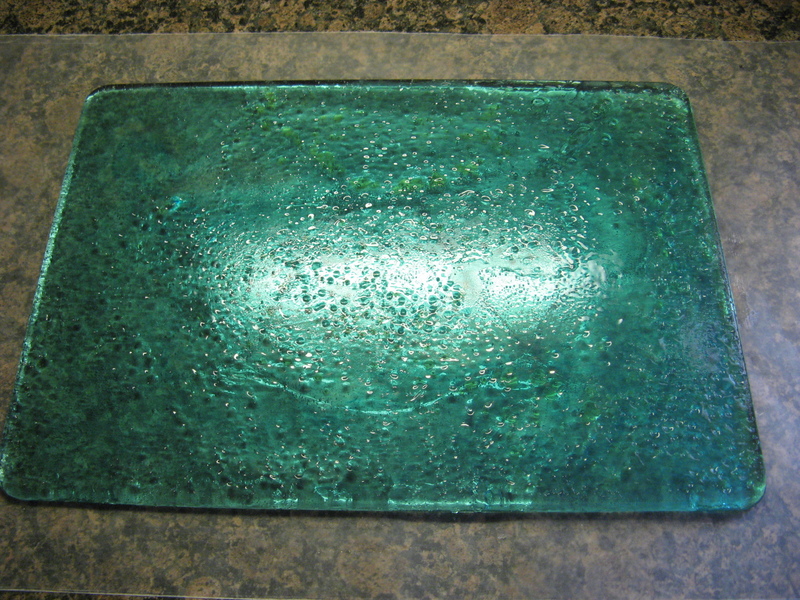 Once the sugar was dissolved I raised the heat to high and brought the mixture to a boil without stirring it to a temperature of 300 F.
Once it reached 300 F I added a few drops of blue dye to the mixture and poured it into a greased rimmed cookie sheet and placed it in the refrigerator until it hardened – about an hour. 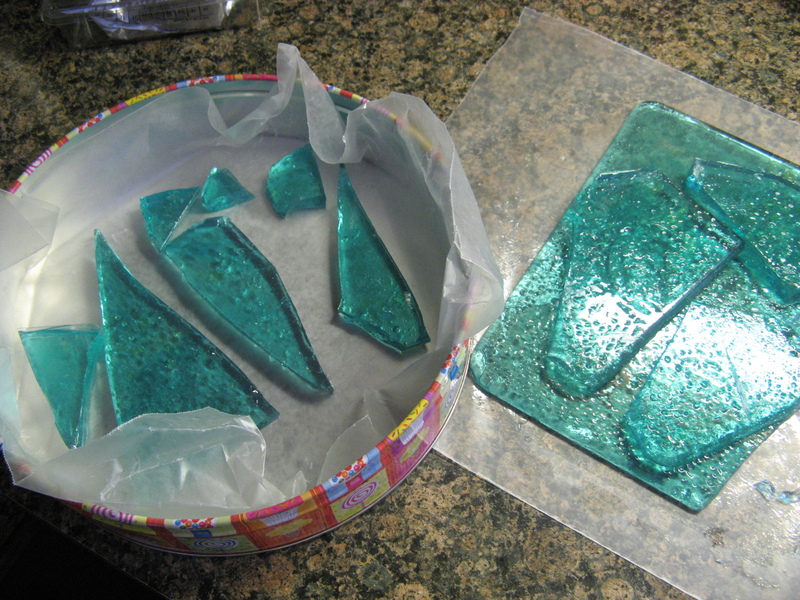 I then unmolded the hard candy onto a sheet of wax paper and broke it into pieces so I could use it as a cake topper for Elsa’s ice castle. With all of the decorative pieces done it was finally time to bake the cakes. 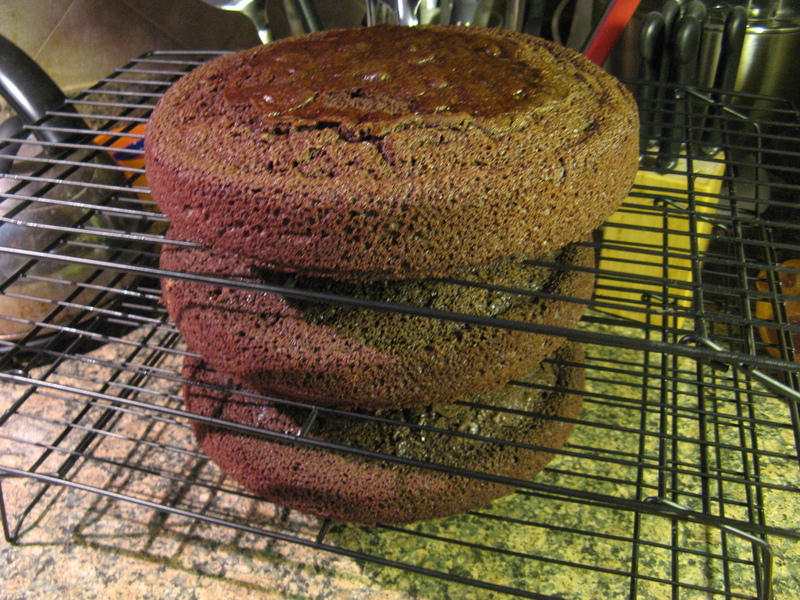 I started with baking the larger of the two cakes – a three-layer 9 inch chocolate cake. 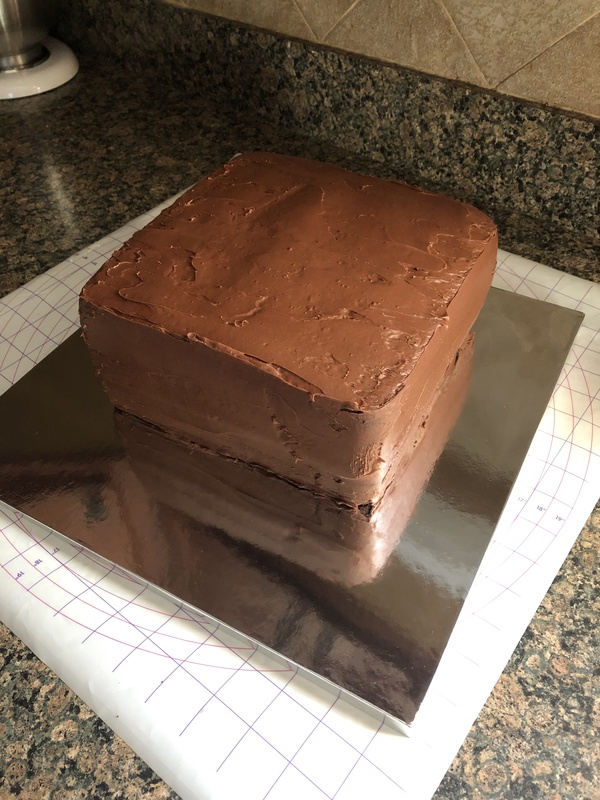 The recipe I was following was for a two-layer cake so I whipped up the batter twice and for the second batch I baked one layer and 12 cupcakes. 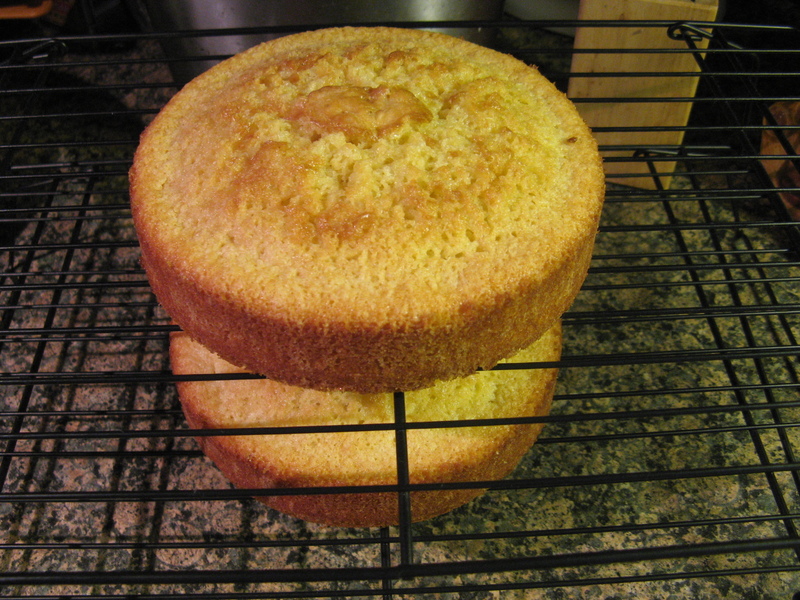 For the smaller of the two cakes I baked a two-layer 6 inch yellow cake. 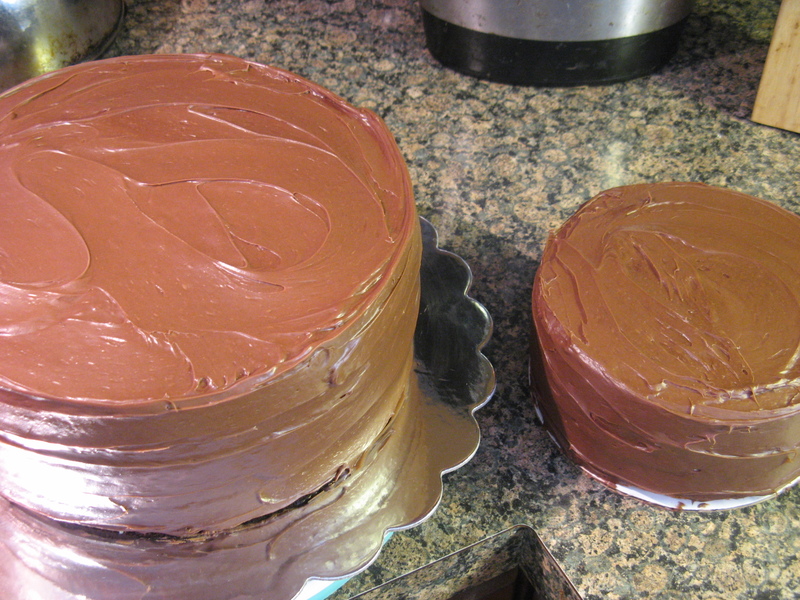 Once I leveled the cakes I frosted the layers and the sides and tops of both cakes with chocolate frosting. I placed both cakes in the refrigerator overnight so the frosting could harden. Which I used to cover the 6 inch yellow cake. 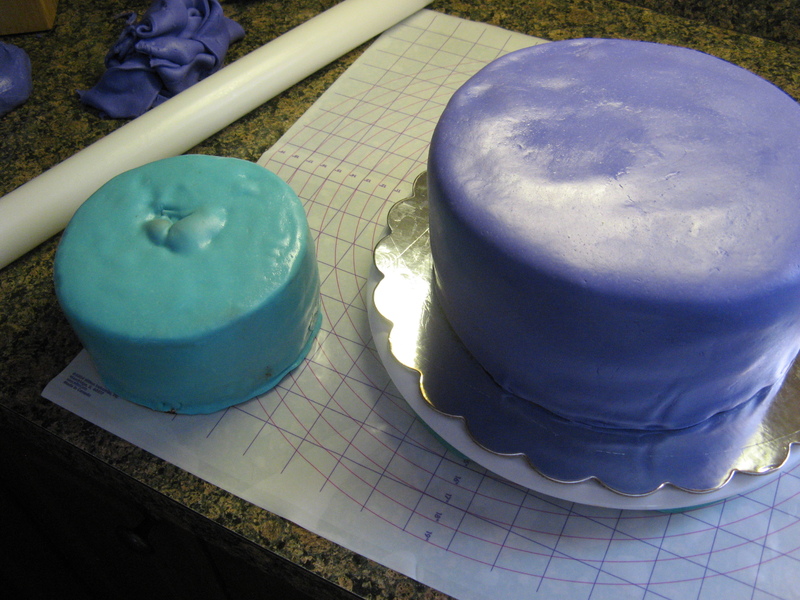 After rolling out the violet fondant I covered the larger chocolate cake. 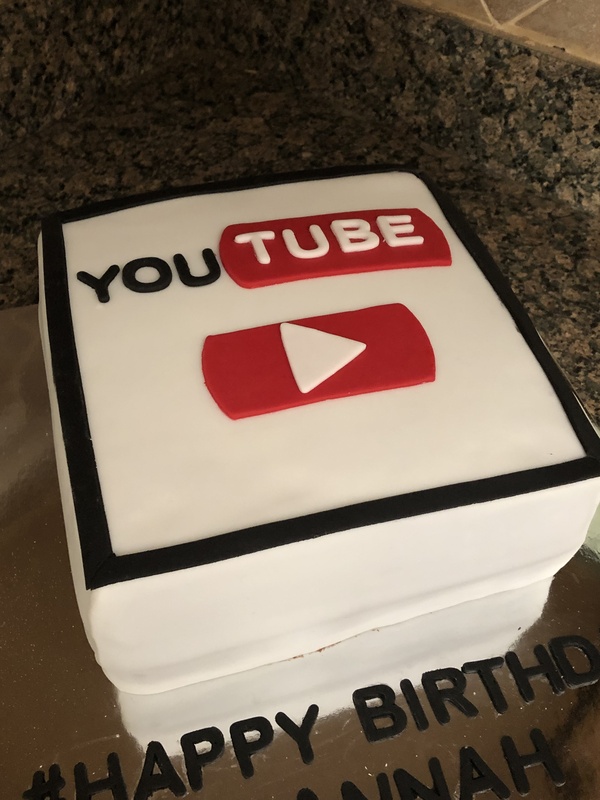 I did end up with an air bubble on the blue cake and while at first I was upset and frustrated with it I soon realized it wouldn’t be a big a deal as I was going to mask it with the candy pieces and figurines. 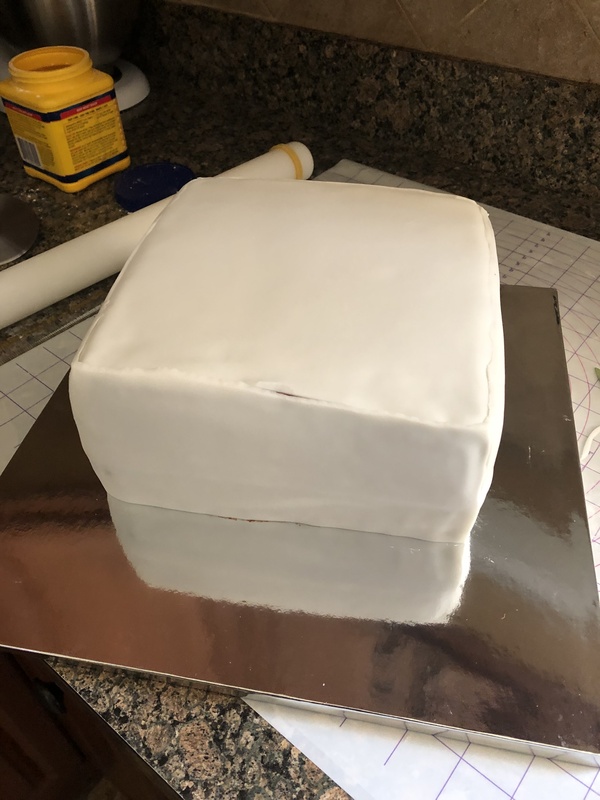 Then it was on to decorating… I wrapped the bottom of both cakes with silver speckled ribbon which I attached to the cake with double-sided tape. Next I attached the smaller chocolate snowflakes to the cake with small dabs of vanilla frosting – I rested the larger snowflakes against the cake. 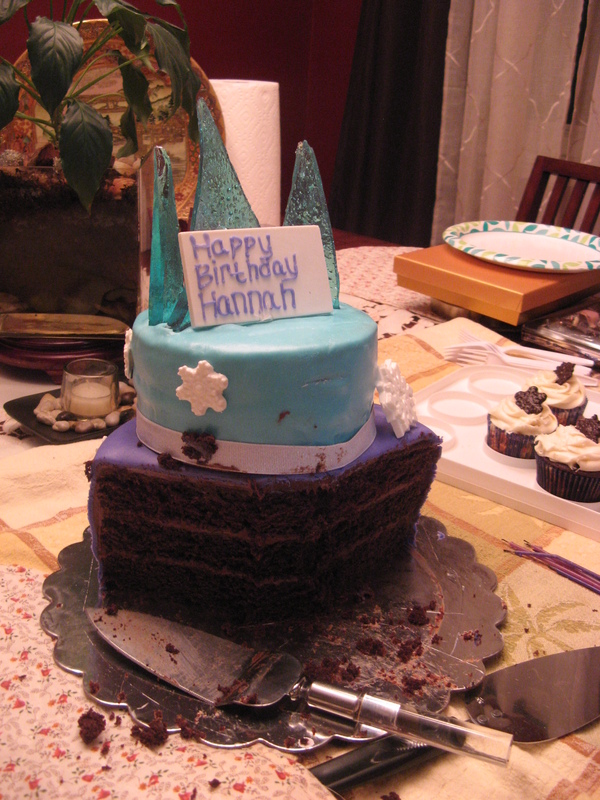 To create the ice castle I pushed down a few pieces of the hard candy onto the top of the smaller cake. 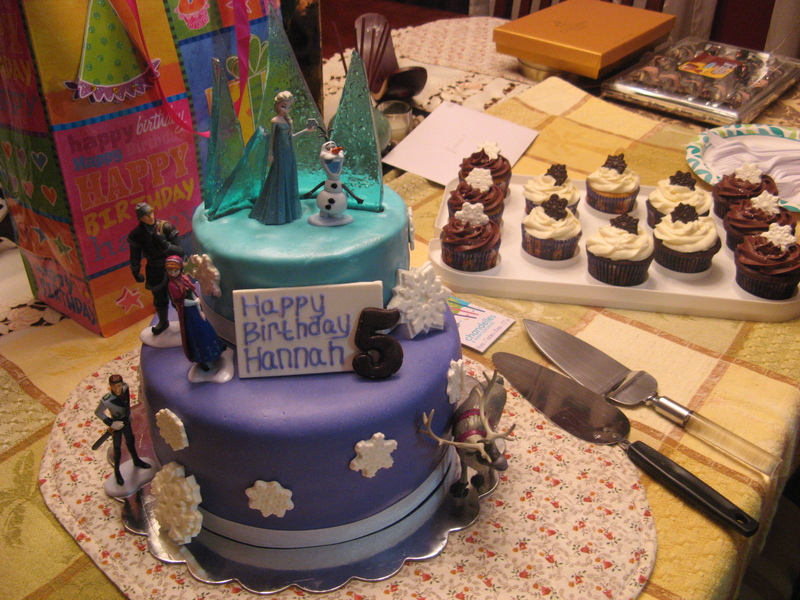 And finally I placed the Frozen figurines – which I was lucky enough to find on the Disney Store’s website as they were sold out in all stores – on the cake. 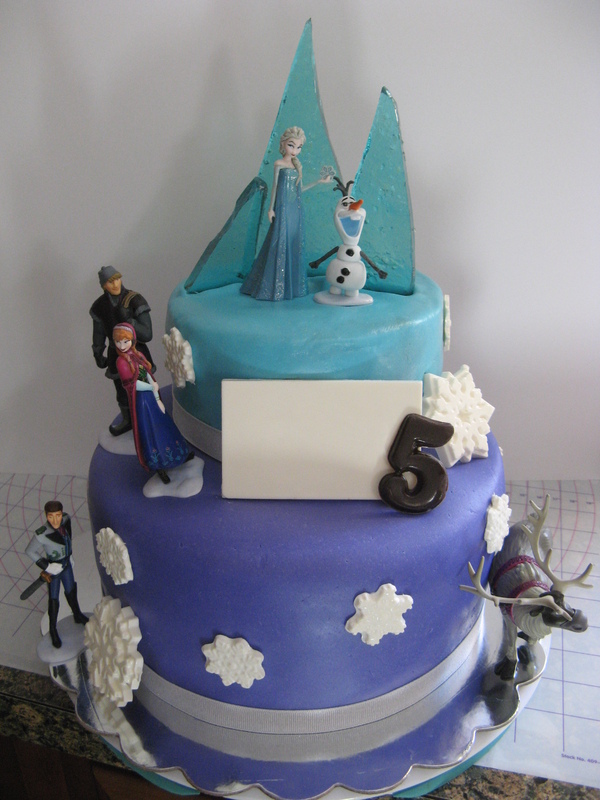 And after carefully transporting the cake – thankfully I wasn’t driving too far – without any of the decorations on it but the small snowflakes I “glued” on I reassembled the entire cake to perfection once again! 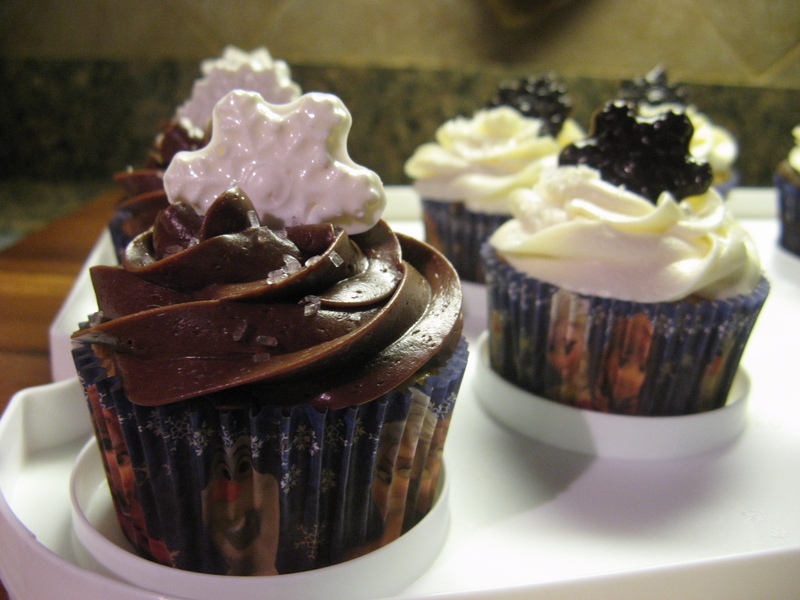 And of course there were Frozen themed cupcakes that I baked in Frozen themed cupcake liners and then topped them with white decorative sugar and a chocolate snowflake! This cake was a hit in appearance and as this picture suggests (and I can attest to as well) in taste! And if you are wondering, yes, all of this work was worth it! The Birthday Girl was absolutely thrilled with her cake and she enjoyed a nice slice of the chocolate cake! 2. 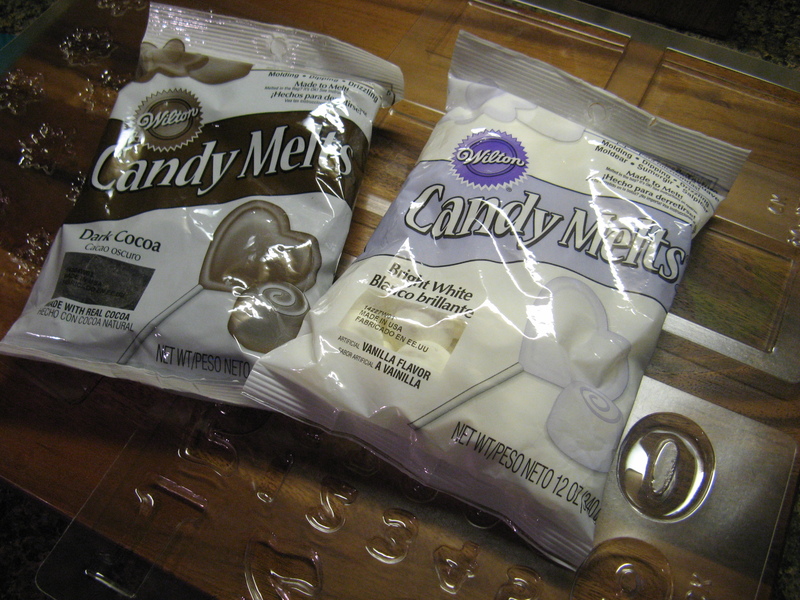 Place 3/4 of the confectioners’ sugar on top of the melted marshmallow mixture. Fold sugar into marshmallow mixture. Flavoring can be added at this point if desired. Place solid vegetable shortening in easily accessed bowl so you can reach into it with fingers as you are working. Grease hands and counter GENEROUSLY; turn marshmallow mixture onto counter. Start kneading like you would dough. Continue kneading, adding additional confectioners’ sugar and re-greasing hands and counter so the fondant doesn’t stick. 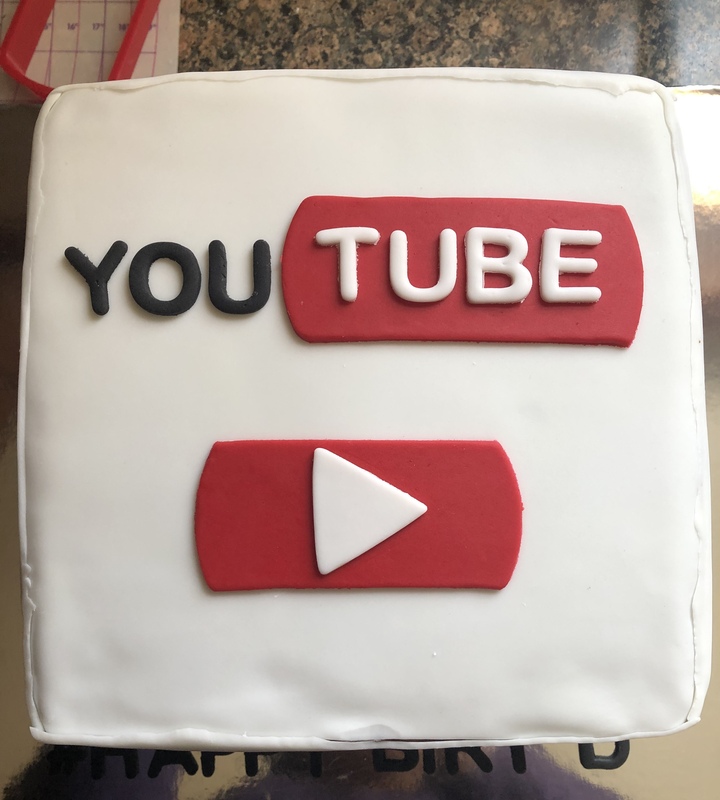 If the marshmallow fondant is tearing easily, it is too dry; add water (about 1/2 tablespoon at a time) kneading until fondant forms a firm, smooth elastic ball that will stretch without tearing, about 8 minutes. 3. It’s best to allow Marshmallow Fondant to sit, double-wrapped, overnight. 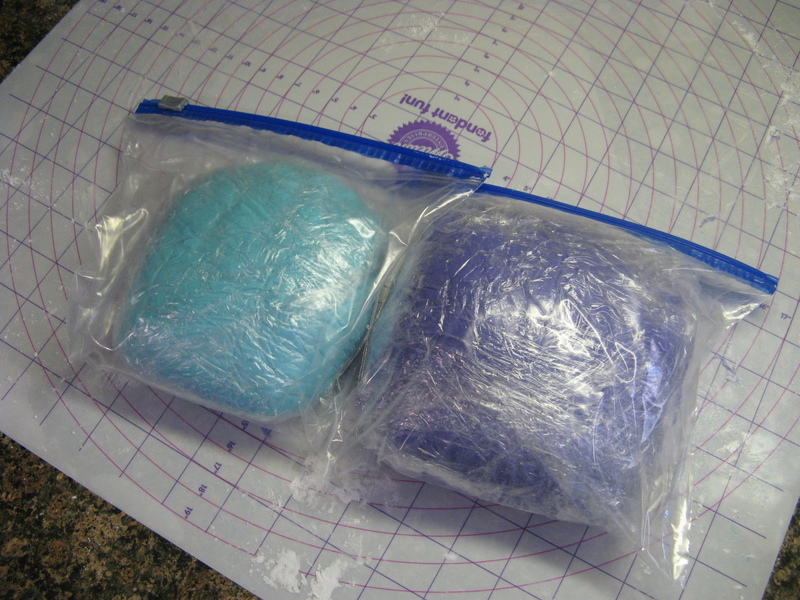 Prepare the fondant for storing by coating with a thin layer of solid vegetable shortening, wrap in plastic wrap and then place in resealable bag. Squeeze out as much air as possible. Marshmallow Fondant will keep well in refrigerator for several weeks. 5. To color fondant: If you need to tint the entire batch of fondant, add a little icing color to the melted marshmallow mixture before adding confectioners’ sugar. 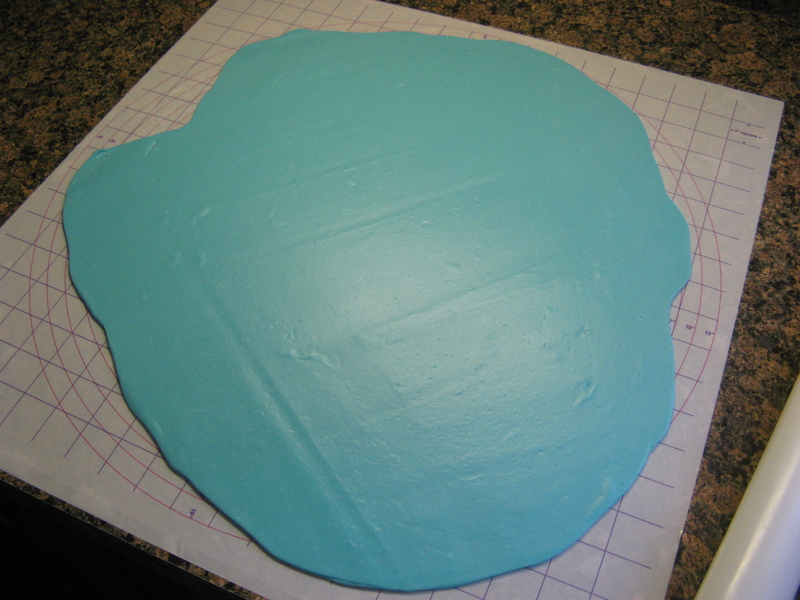 For smaller amounts of tinted fondant, add icing color to portions of fondant as needed. 1. Heat oven to 350°F. Butter the pans, line the bottoms with parchment, butter again, and dust with cocoa, tapping out the excess. 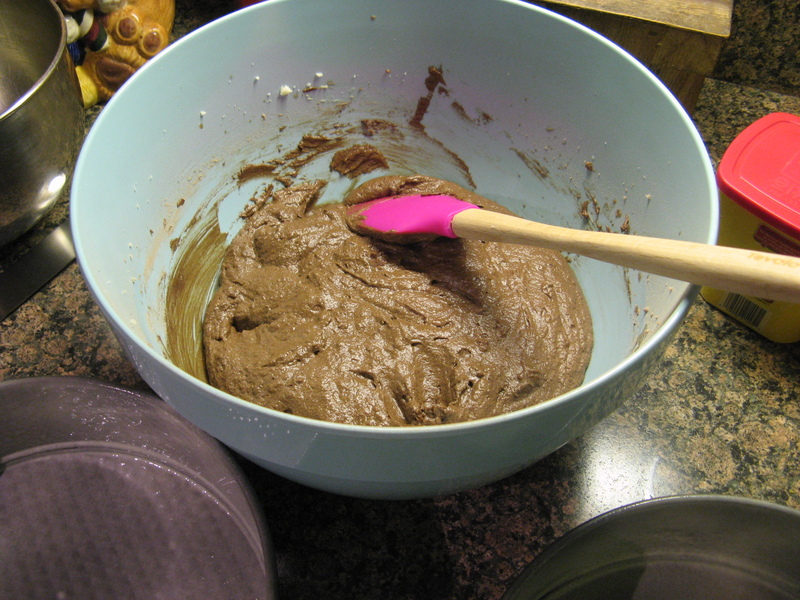 In a medium bowl, whisk together the flour, cocoa, baking powder, baking soda, and salt; set aside. 2. 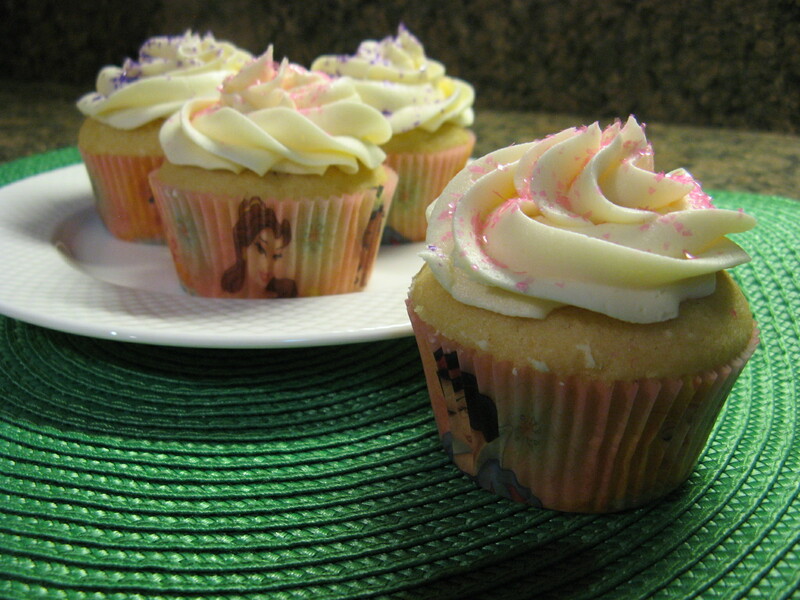 Using an electric mixer, beat the butter and sugar on medium-high until fluffy, 2 to 3 minutes. Beat in the vanilla, then the eggs one at a time, scraping down the sides of the bowl as necessary. 3. Reduce mixer speed to low. 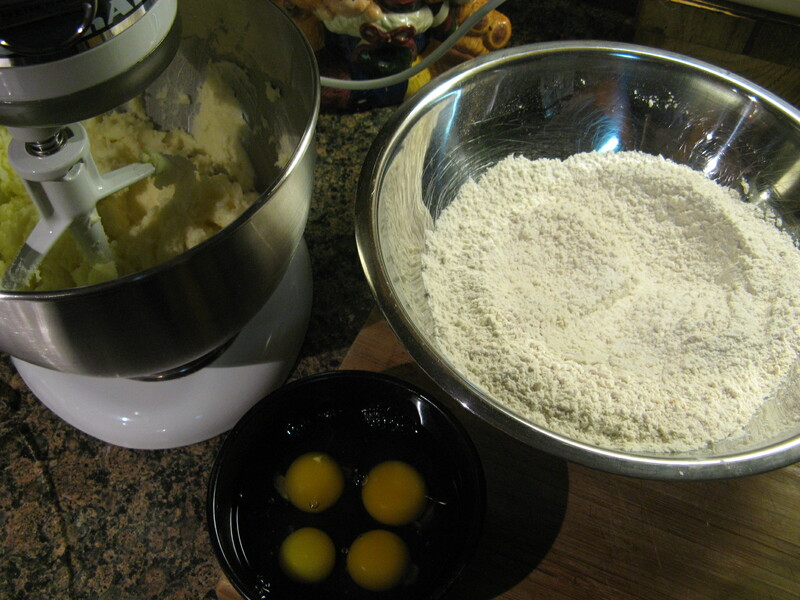 Add the flour mixture in 3 additions and the milk in 2 additions, beginning and ending with the flour mixture. Mix just until combined (do not overmix). 4. Transfer the batter to the prepared pans and bake until a toothpick inserted in the center comes out clean – approximately 25 to 30 minutes for two 9-inch rounds. 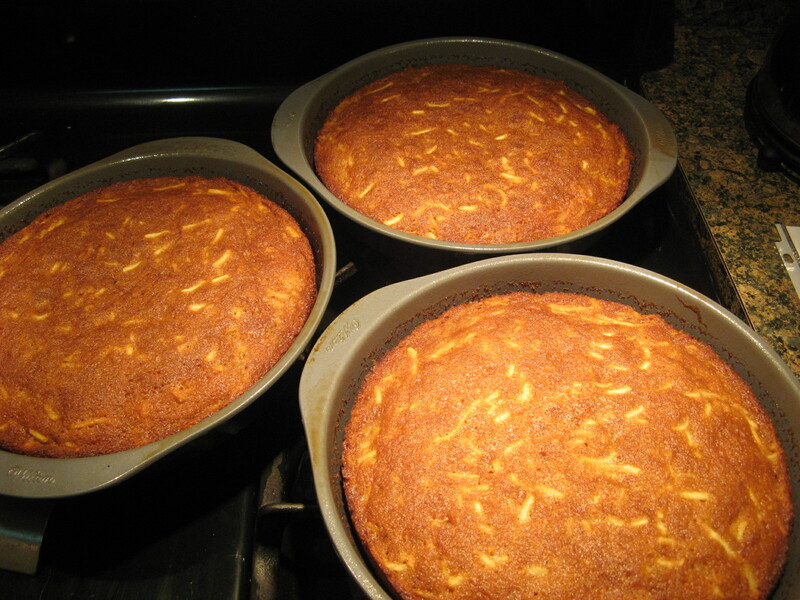 Cool the cakes in the pans for 15 minutes, then turn out onto racks to cool completely. 1. 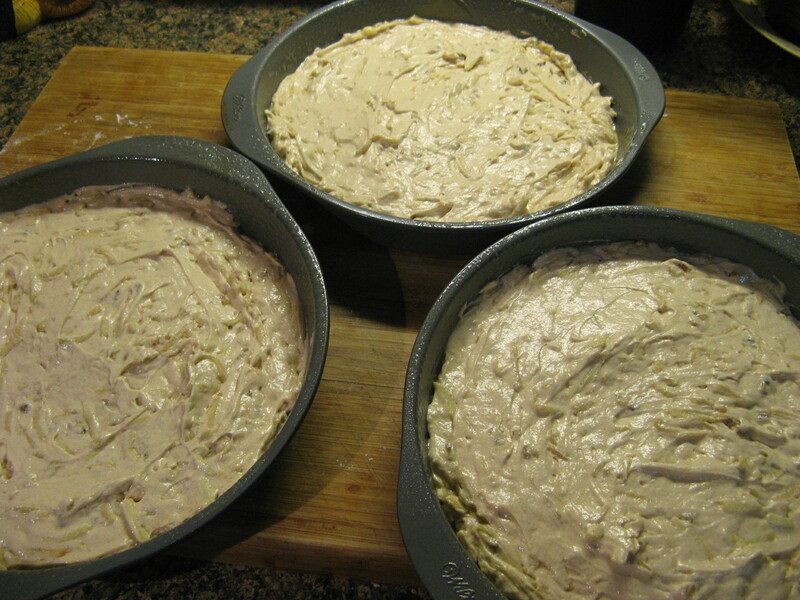 Preheat the oven to 350° F. Butter and flour two 6-inch round cake pans and knock out the excess flour. 2. Sift together the flour, baking powder, and salt. 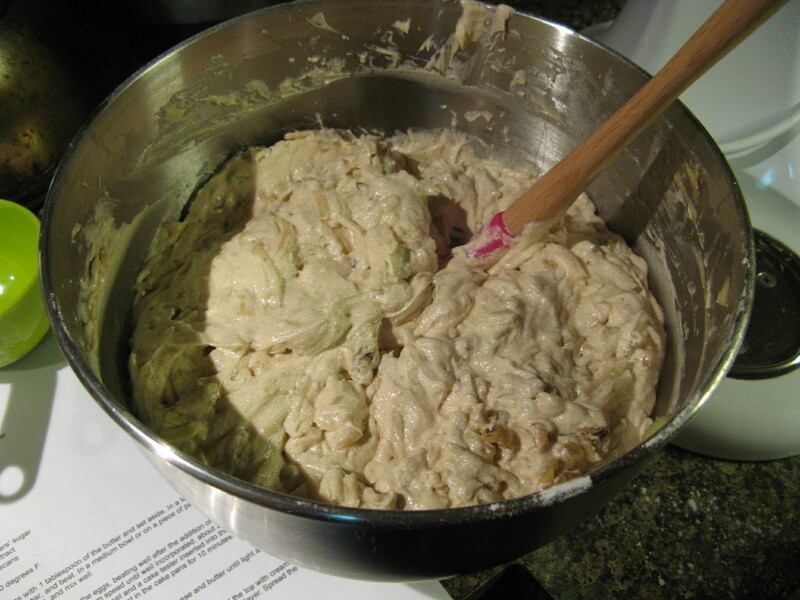 In a large bowl, using an electric mixer on medium speed, beat the butter until soft and creamy. Add the sugar and continue beating until the mixture is light and fluffy, 2-3 minutes. (If you’re using the organic sugar, the texture of your mixture will be quite gritty.) Beat in the eggs, one at a time. Add the vanilla. 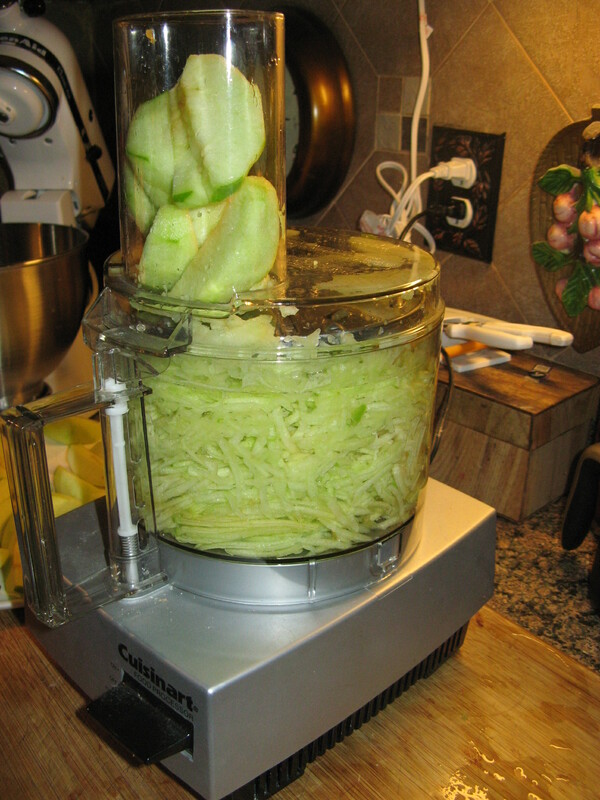 On low speed, gradually add the dry ingredients until thoroughly blended. 3. Spoon equal amounts of batter into each pan and smooth the tops evenly. Bake for about 30 minutes, or until light golden and a cake tester comes out clean. Let the layers cool in the pans for 10 minutes, then unmold onto wire racks to cool completely. 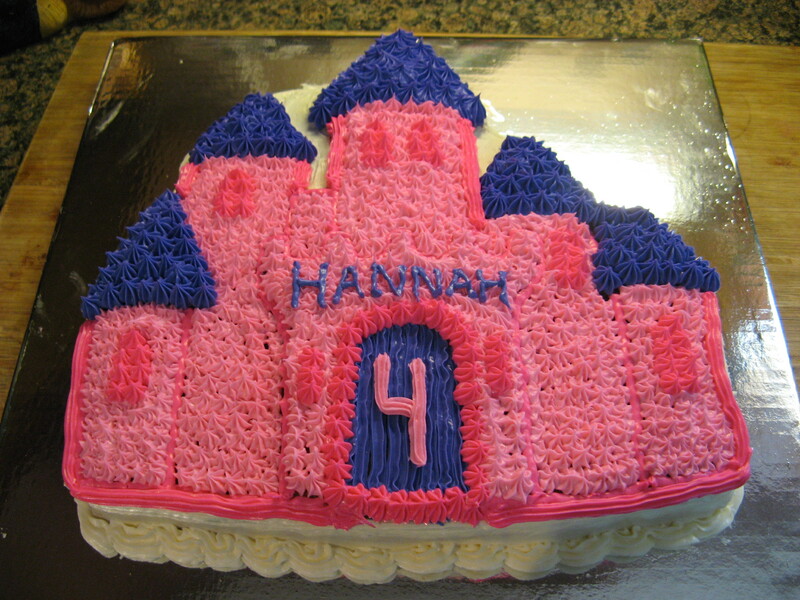 First it was an Elmo Cake, then a Minnie Mouse Cake and this year my friend’s daughter requested a “princess cake.” I stretched that idea a tad and made an Enchanted Castle Cake which I then surrounded with her Disney Princess figurines. 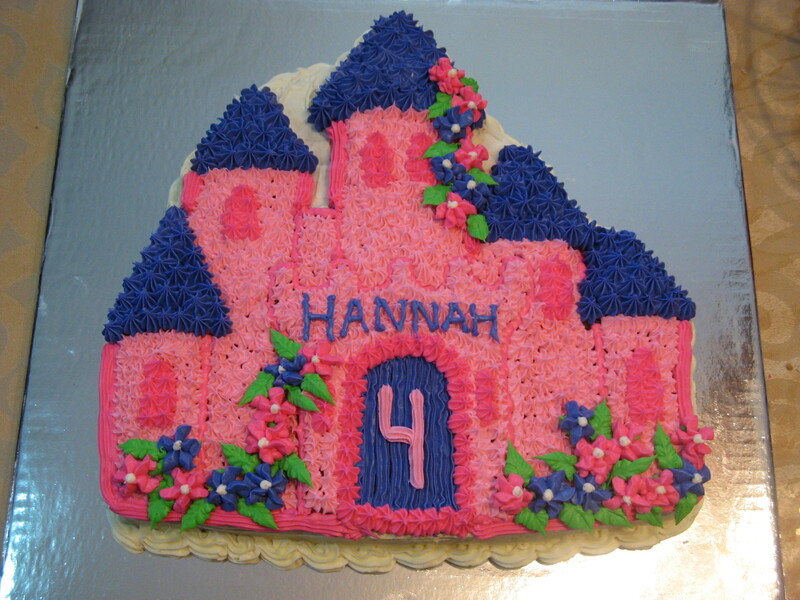 My reasoning… Princesses usually live in castles! The most important thing though…. She loved it. 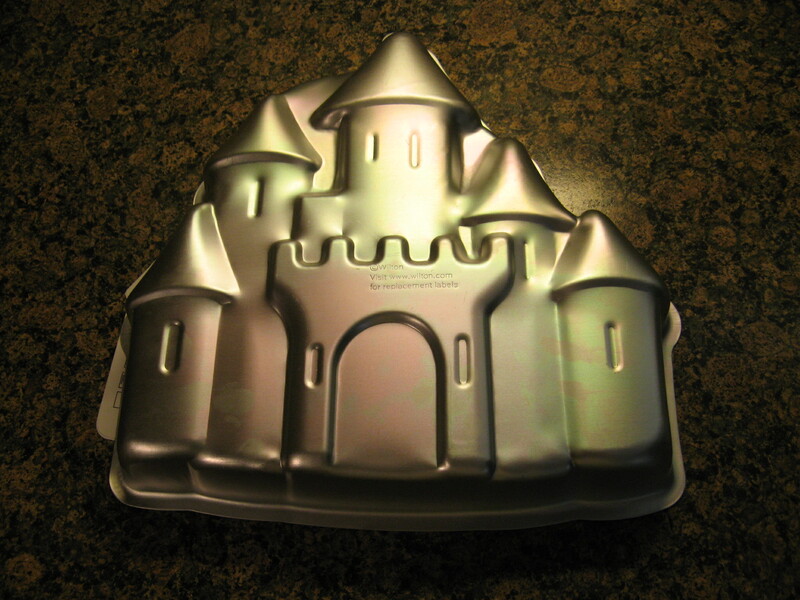 And while last year I opted to rent the Minnie Mouse pan this year I just went ahead and purchased the Enchanted Castle Pan from Wilton. 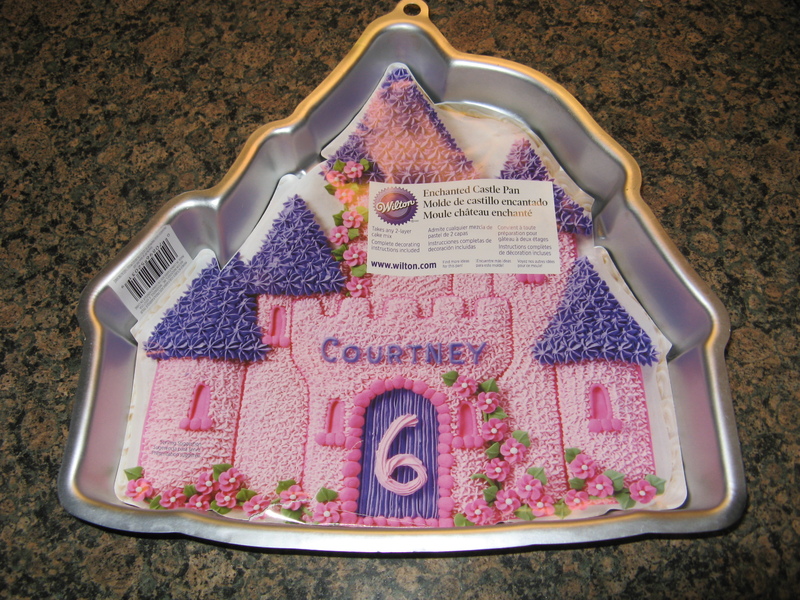 Luckily Wilton has numerous different ideas for that pan so I am sure I will get a few more uses out of it. I will say that I did cheat a bit for this cake by using a Betty Crocker Yellow Cake Mix and a few containers of Betty Crocker Vanilla Frosting which I tinted in the appropriate colors. The before picture of the cake. 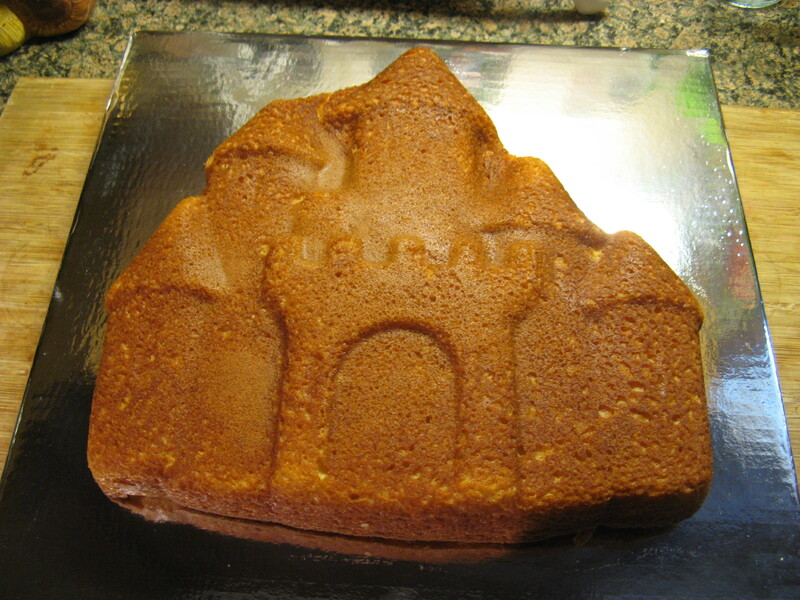 Luckily the important aspects of the cake were visible for me to decorate, but, I did have to freehand the windows. Little by little the castle came alive. Of course I had my doubts along the way. But, at this point of the decorating I was very happy with the outcome. 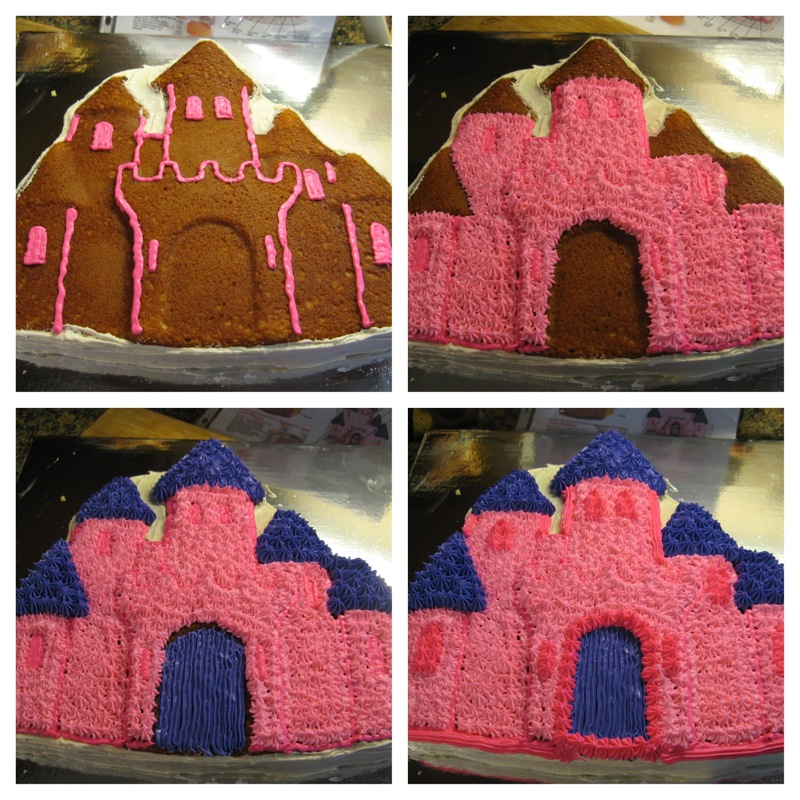 All that was left was to add flowers to the castle. Since I have never been that good at making flowers, I decided to make them separately and then add them to the cake. 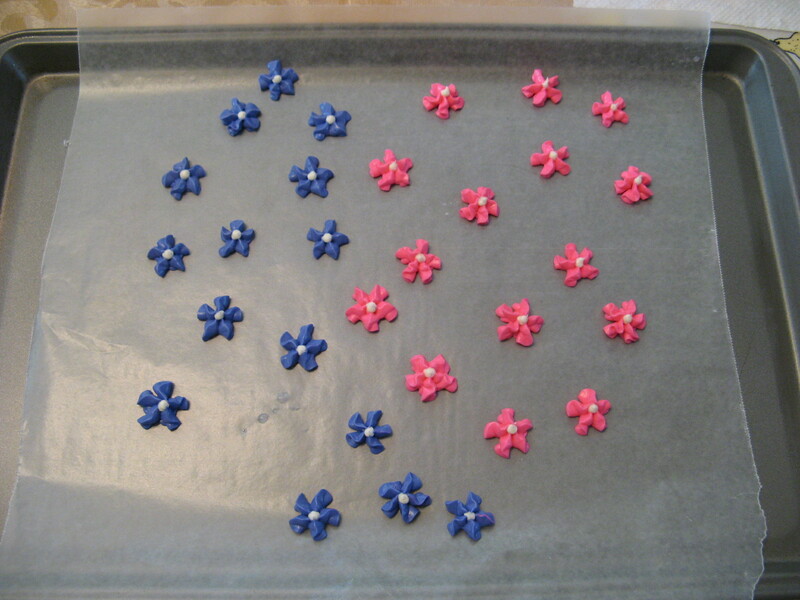 I made simple drop flowers on wax paper and then let them set for a while before placing them in the freezer for a few minutes to make transferring them to the cake easier. I then “glued” them onto the cake with green tinted icing and then piped in some leaves for the final touch. 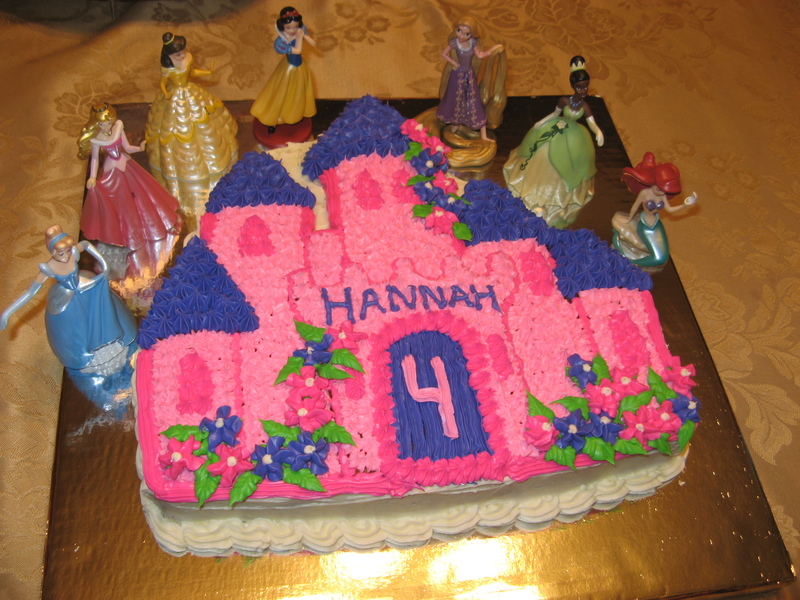 And you can’t have a princess cake without some princesses. 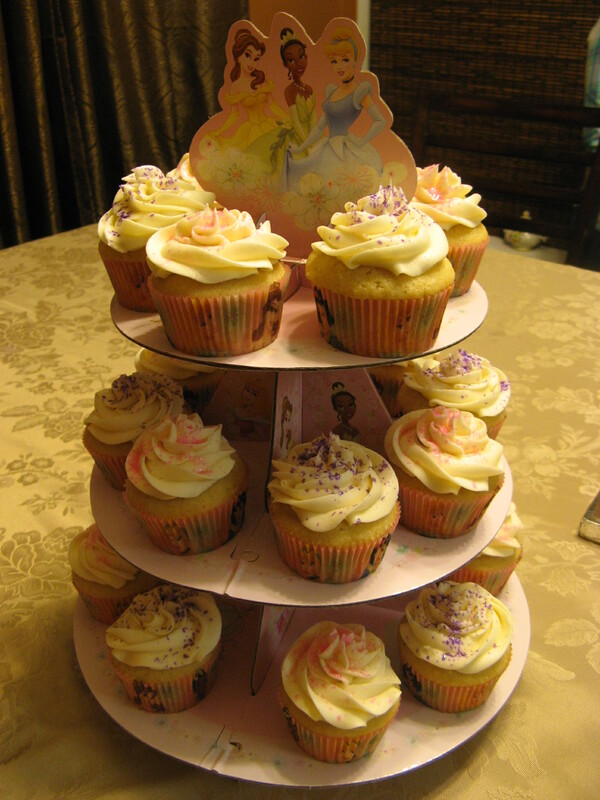 Along with the cake I also make Vanilla Squared (vanilla cake with vanilla frosting) cupcakes which I baked in Disney Princess cupcake liners and sprinkled with pink and purple cake sparkles then displayed on a Disney Princess cupcake stand. I wonder what next year’s theme will be…. Preheat the oven to 350 degrees F. Line a 12-cup muffin pan with paper liners. Whisk the flour, baking powder and salt in a bowl. 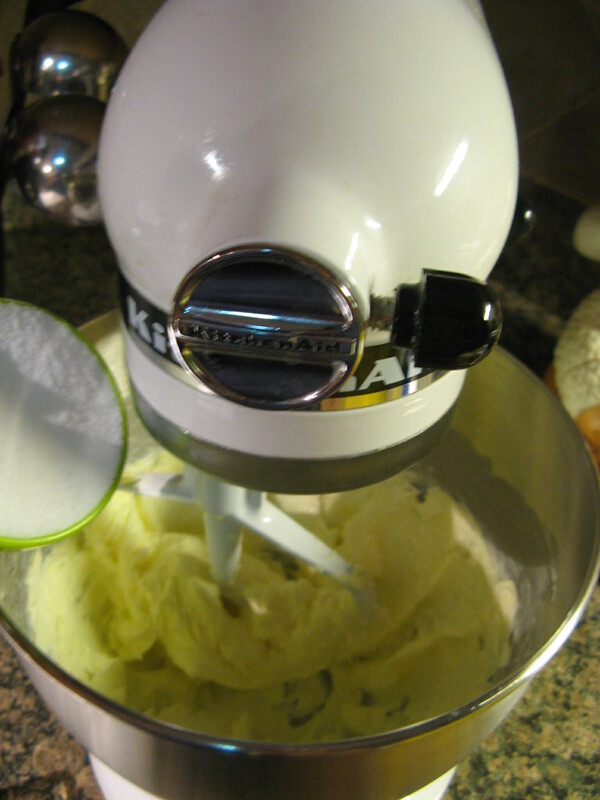 Beat the butter and sugar in a stand mixer fitted with the paddle attachment on medium-high speed until fluffy, about 4 minutes. Beat in the eggs, one at a time, scraping down the bowl as needed. Beat in the vanilla. Reduce the mixer speed to medium low; beat in half of the flour mixture, then all of the milk, then the remaining flour mixture until just combined. 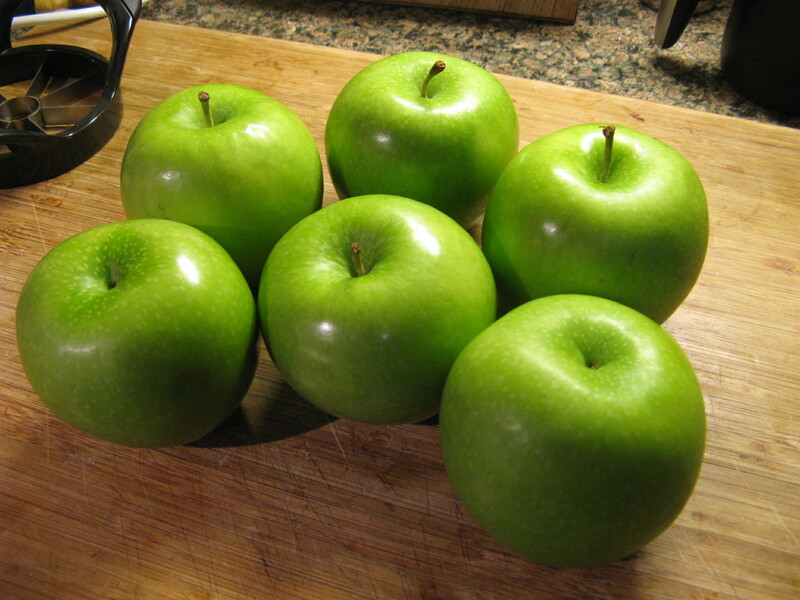 A good friend recently celebrated a birthday and a few days prior to it I asked her what kind of cake she would like me to bake for her and she responded with an apple cake. The only apple cake I could recall making was an Apple Walnut Cake that really wasn’t what I would consider to be a birthday cake. 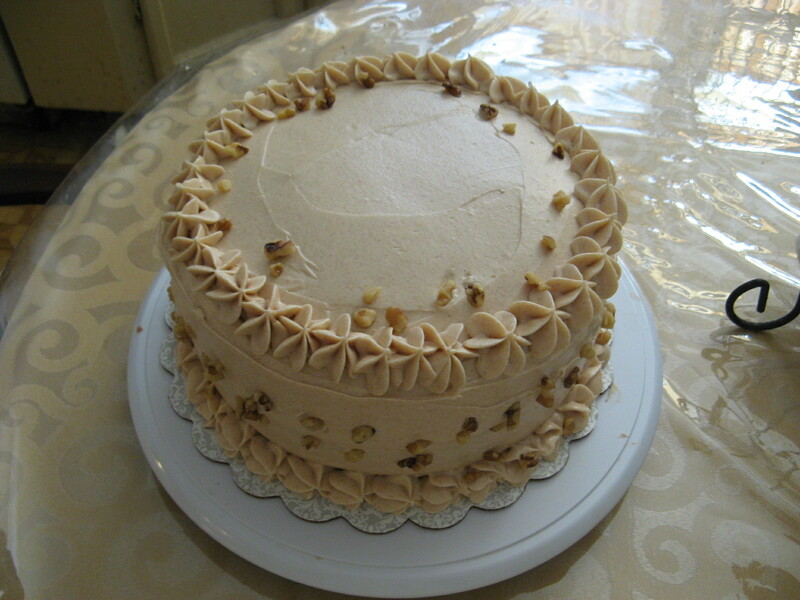 So, after a few texts back and forth we settled on an apple cake with walnuts with a cinnamon cream cheese frosting. 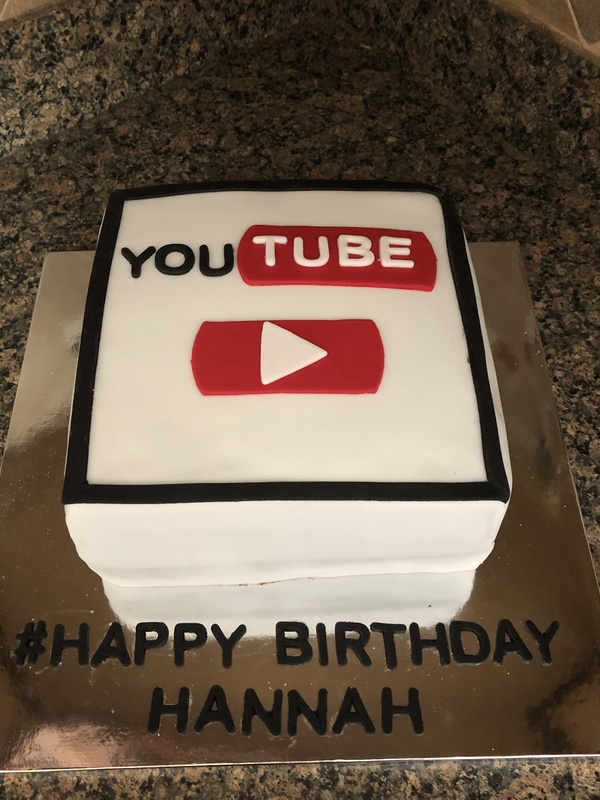 While her birthday technically falls in the summer according to the calendar it’s unofficially in the fall since it is after Labor Day, hence this cake being the quintessential fall birthday cake. Since I haven’t mastered creating my own recipes I did a few internet searches to find a recipe for the cake and frosting. 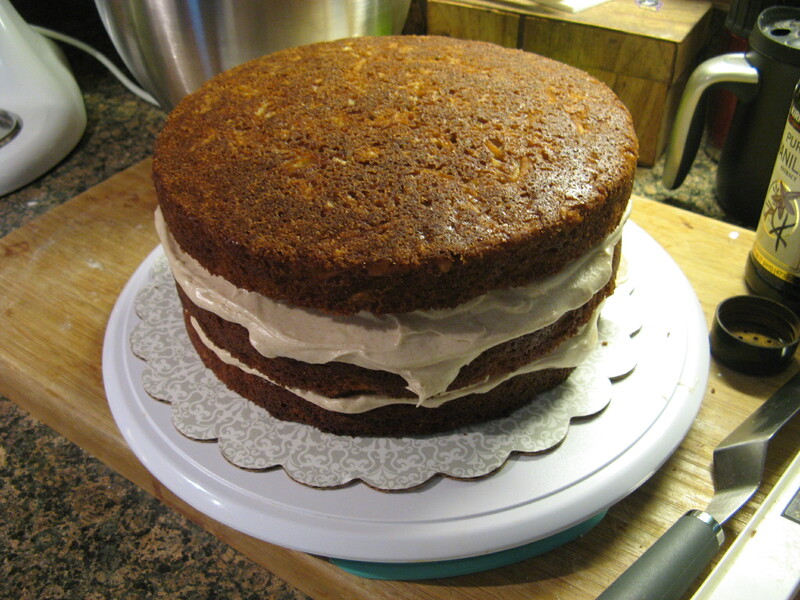 After coming up empty handed I decided to follow the recipe for my favorite carrot cake and substitute grated apples in lieu of the carrots and for the frosting, I made my favorite cream cheese frosting and added in ground cinnamon in small increments until I reached my desired flavor. 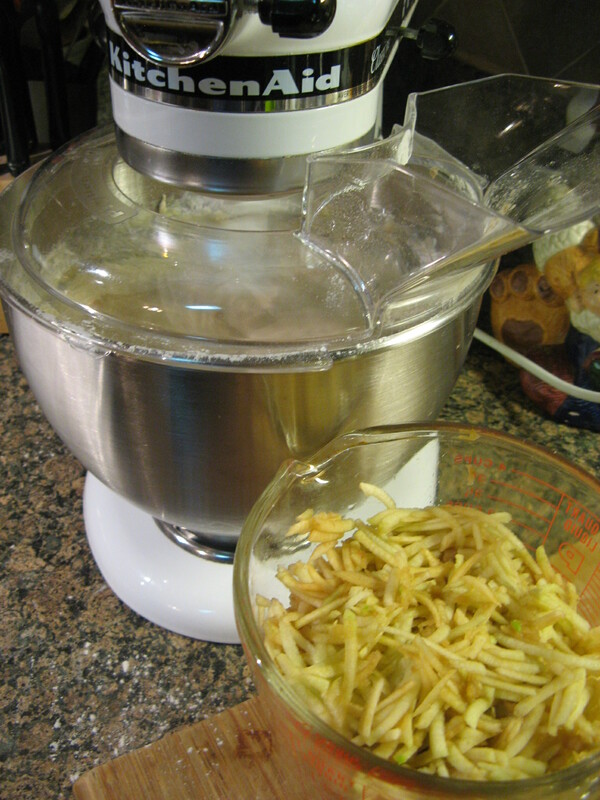 And finally grated them using a food processor. 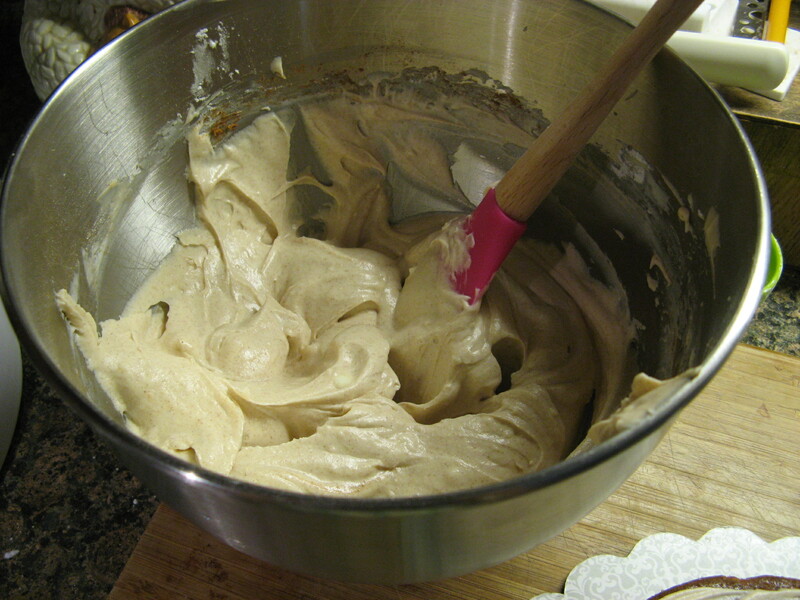 I started the batter by combining the dry ingredients and setting it aside. I then creamed butter and sugar together. Once the butter and sugar were mixed together well I added in the eggs and dry ingredients by alternating between the two. And them some vanilla extract. 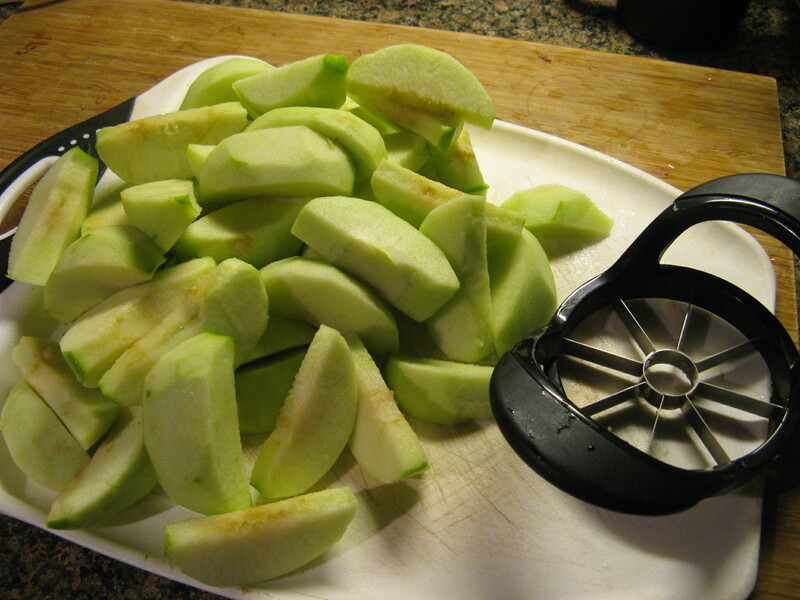 It was then time to add in the grated apples. And finally I folded in some chopped walnuts. 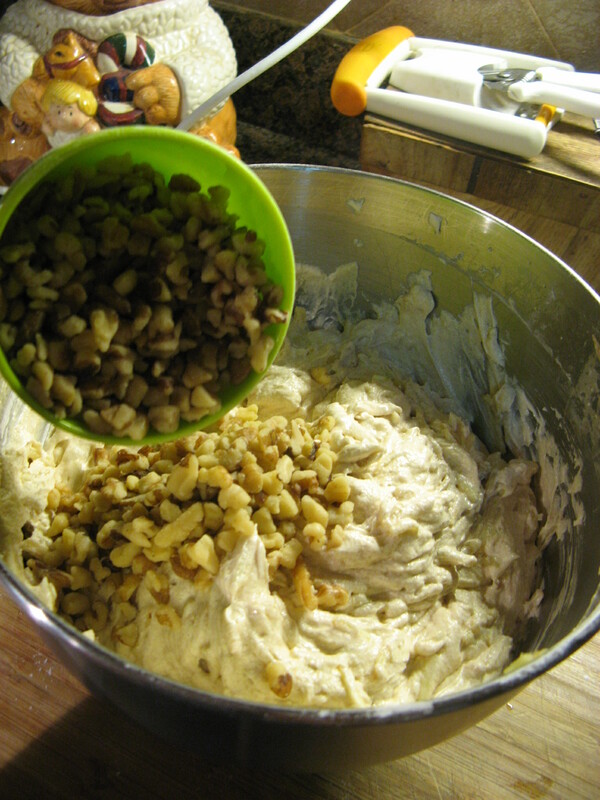 Once the walnuts were incorporated well into the batter it was time to divvy it up among my prepared pans. Once divided I popped them into a 350 degrees oven. 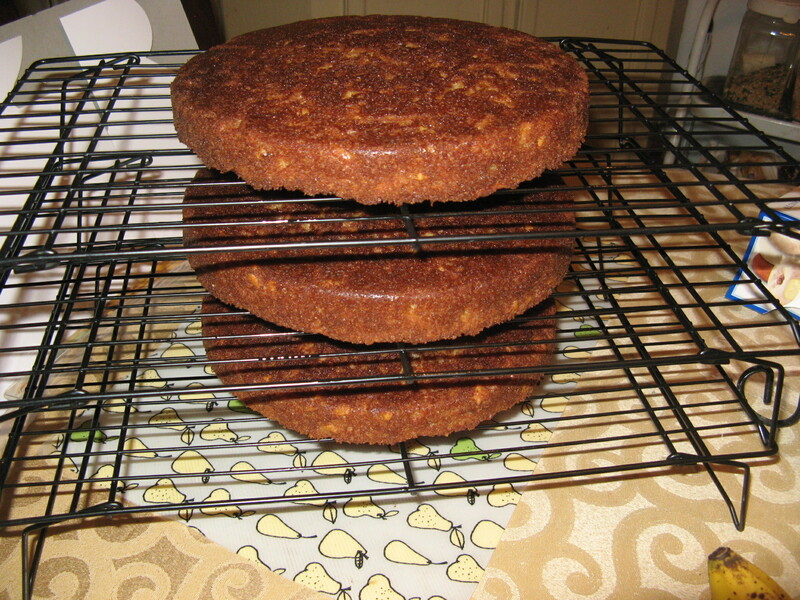 After baking for 25 minutes the cakes were done. I let them cool for a bit in the pans and then inverted them onto cooling racks to let them cool completely. After the cakes cooled completely I made the Cinnamon Cream Cheese Frosting by combing cream cheese, butter, confectioners’ sugar, vanilla extract and of course cinnamon. 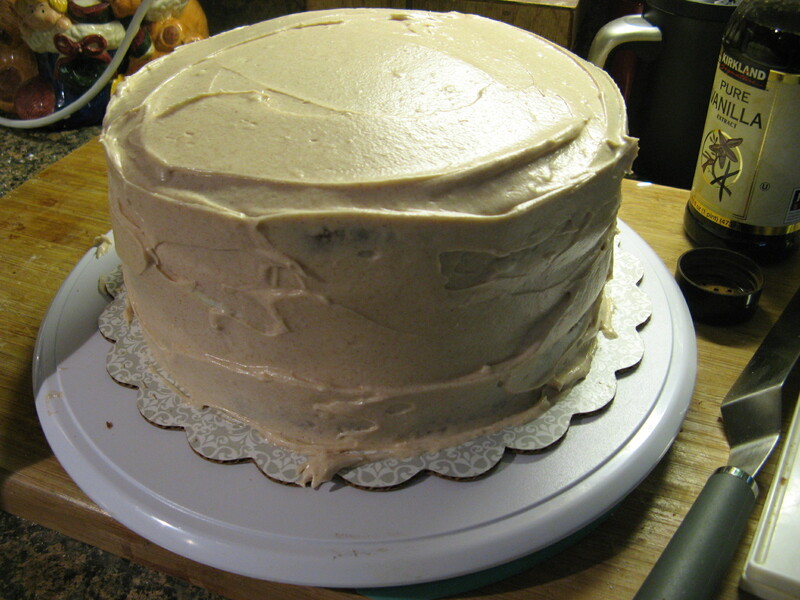 And then crumb coated the cake and refrigerated it for a bit while I made another batch of frosting to finish covering the cake and for decorating. And then I added some decorations and scattered some walnuts along the sides of the cake prior to writing a birthday message on it. Final verdict: It was a hit… Definitely something I’ll make again! 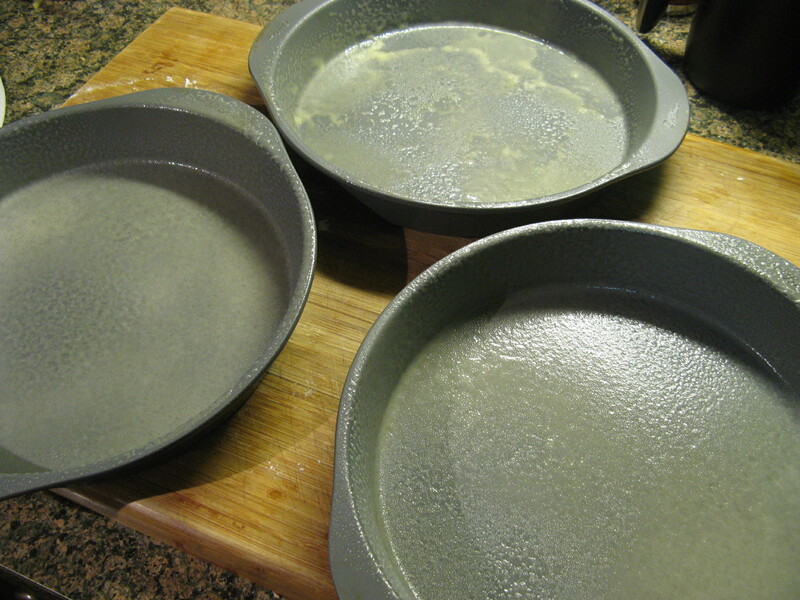 Spray 3 (9-inch) cake pans with baking spray and set aside. 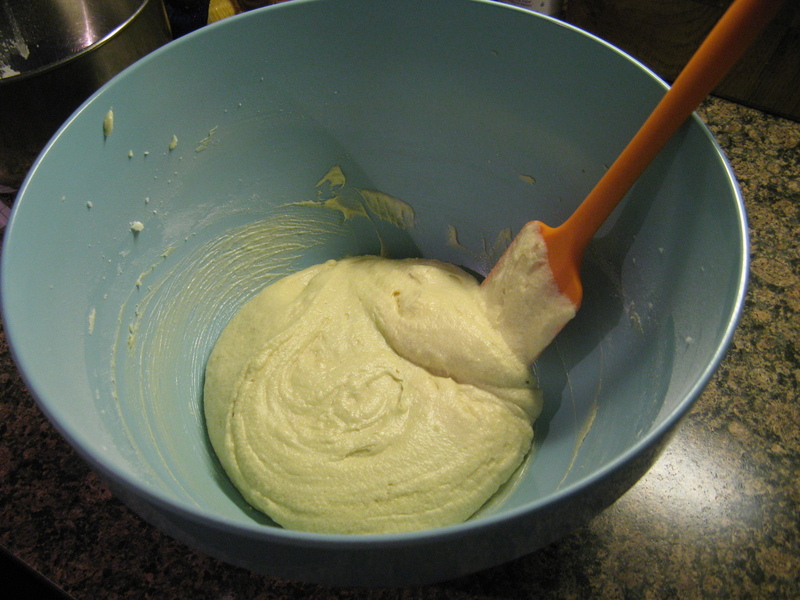 In a large bowl, cream the butter with an electric mixer. Add the sugar, and beat. 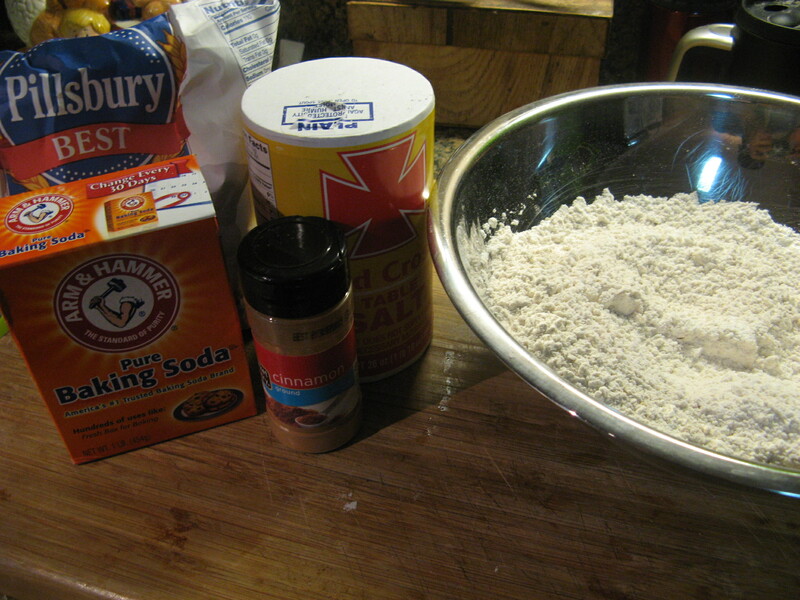 In a medium bowl combine the flour, baking soda, cinnamon, and salt and mix well. Add the dry ingredients, alternating with the eggs, beating well after each addition. 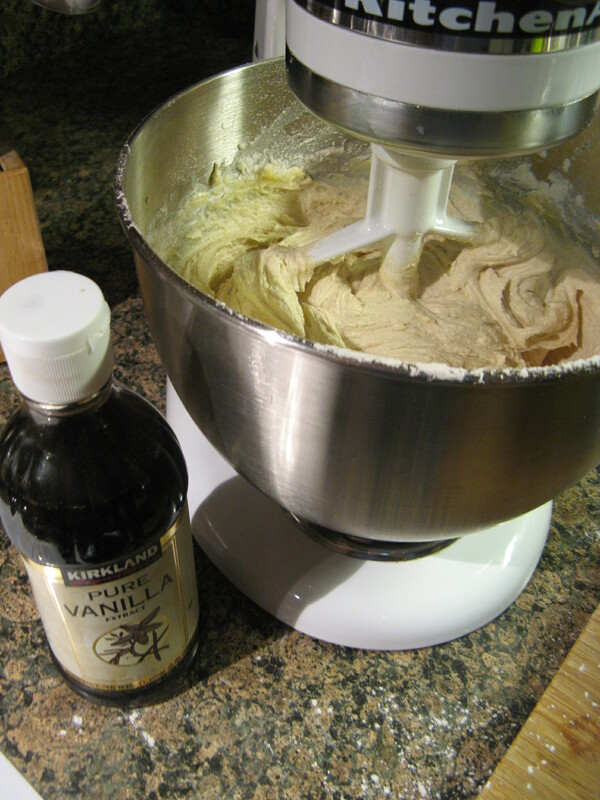 Add the vanilla extract and mix. 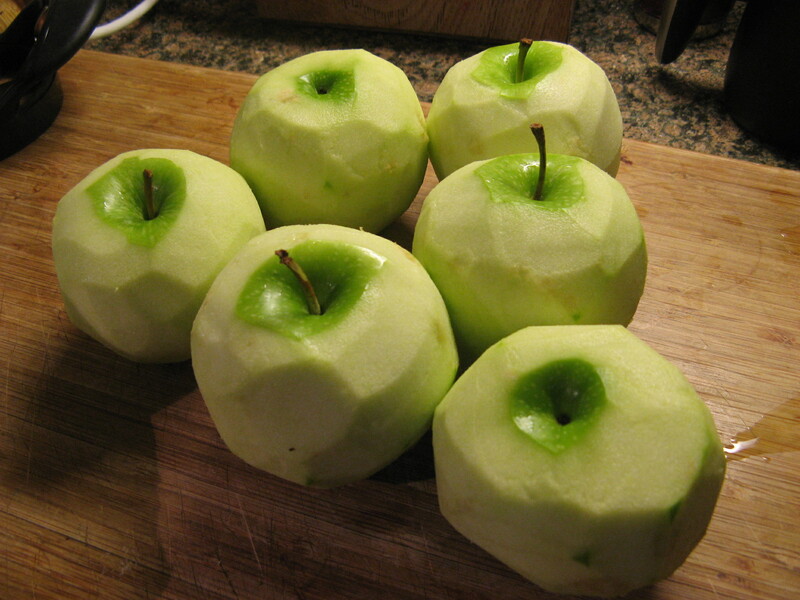 Add the apples and beat on medium speed until well incorporated, about 2 minutes. Fold in the walnuts. Divide the batter between the 3 cake pans and bake until set and a cake tester inserted into the middle comes out clean, 25 to 30 minutes. 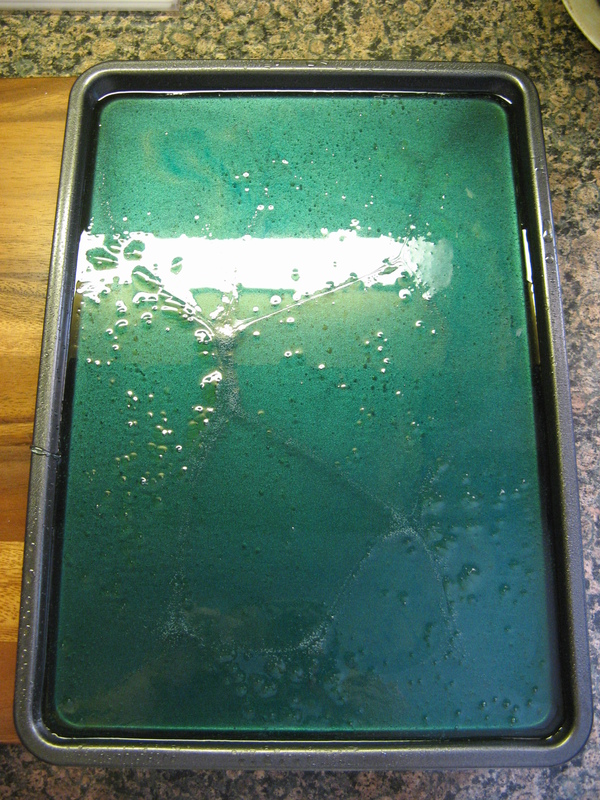 Remove from the oven and let rest in the cake pans for 10 minutes. Invert onto wire racks, remove from the pans, and let cool. In a medium bowl cream together the cream cheese and butter until creamy. Add in the vanilla extract and then gradually add in the confectioners sugar. And finally mix in the ground cinnamon.